Author Diane Gow McDilda comes from the position that living green is first and foremost a mindset. An environmental journalist with a degree in environmental engineering, she kicks off the book with a playful quiz for you to gauge your current eco-footprint. 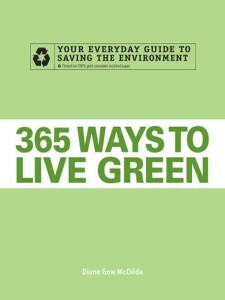 She goes on to break down 18 life arenas and offers advice and resources on how to live green within each. Subjects include: working in the home and yard; building and furnishing your home; travel and transportation; celebrating holidays; and investment and estate planning. She concludes 365 Ways with a chapter on “When You Want to Do More.” It’s a comprehensive handbook, and for you, if you are like me, if you like lots of information in concise, bite-sized points. One of my personal take aways from this living green book comes from the “365” in the title; it is an every day thing, part of my lifestyle, part of my life.